Unit 34C Lot 17; TOT ID# 1639....Saltwater Serenity sits 300 yds. off the bluff on the ocean side of the highway. This home provides spectacular white water views. Your vacation begins once you walk through the door. Put your belongings in the spacious closets and grab a glass of wine. Then enjoy the sound of the ocean on the roomy deck which offers less wind and privacy from people walking on the public bluff trails. Relax, your beds are already made. There are three bedrooms including a master suite and jr. suite. 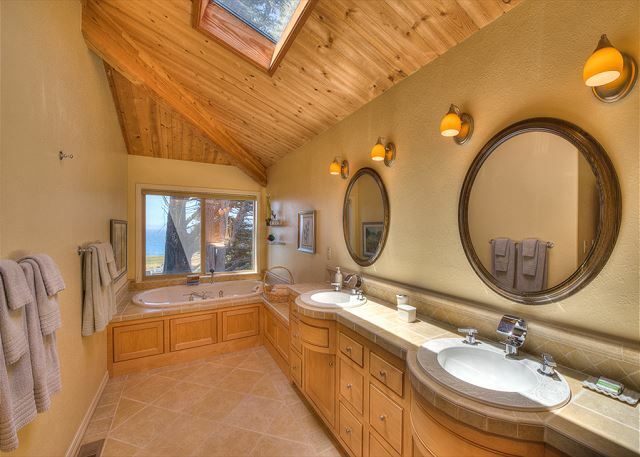 The master bath contains spa like features including a Jacuzzi tub with back and neck jets. A walk in shower boast three body sprays, two shower heads, hand held shower, bench and a steam unit. 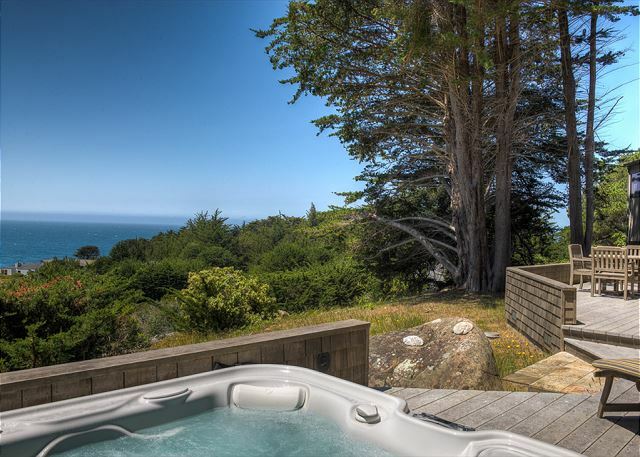 Unwind in the outside hot tub while watching the surf or stars. Bed linens and towels are included with this rental. 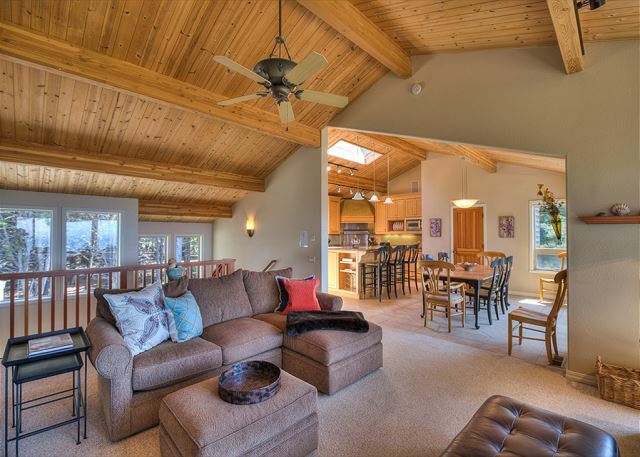 This inverted floor plan creates a peaceful retreat upstairs while other guests can play in the media room below. Enjoy DVD’s, Satellite TV, and CD, iPod dock or games and puzzles. An Elan multi room home entertainment system gives audio opportunities in many areas. 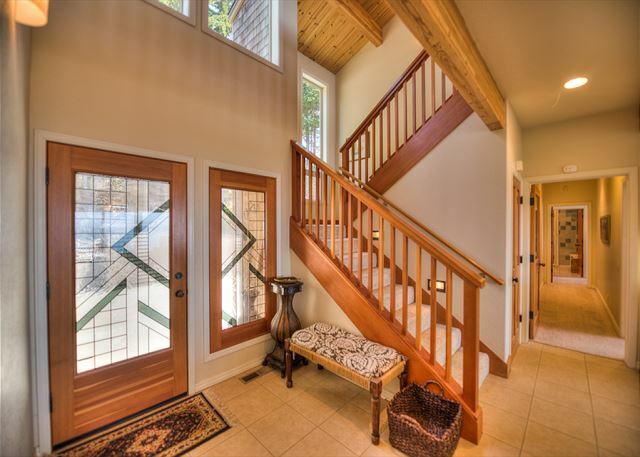 You will find your serenity in the heart of the home upstairs. The living room invites you to curl up on cozy furniture placed around a gas woodstove with views of the horizon. Cooks will not want to leave the gourmet kitchen. Have fun cooking a fabulous meal on the six burner Viking stove or BBQ on the Lynx gas grill. If dinner is prepared in advance, keep it hot in the warming drawer. 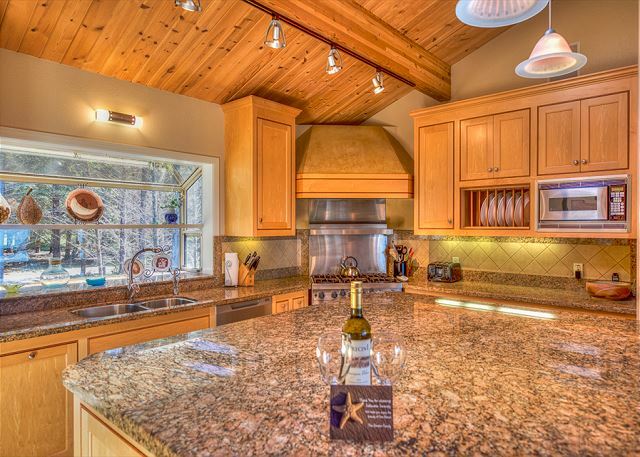 The center island is a wonderful place to converse over that wine you just pulled out of the wine refrigerator. Turn on the Elan system to create an entertaining atmosphere. This home is located on a quiet cul-de-sac between Walk on Beach and the Del Mar Recreation Center, which makes outdoor activities convenient. Outside shower is available for quick rinse after a fun trip to the beach. Due to safety issues, homeowner suggests guests age 12 and older occupy this home rental.. 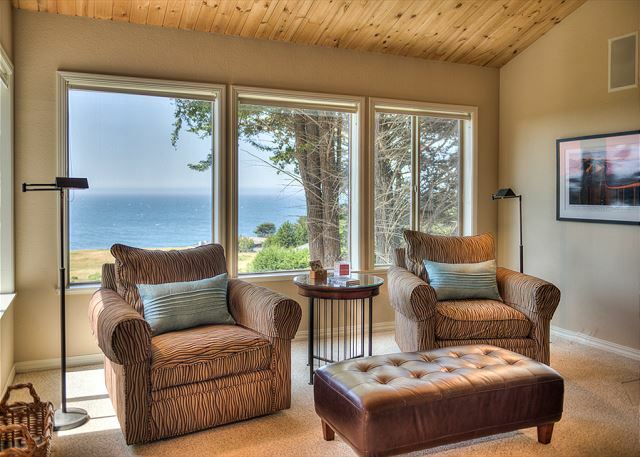 Enjoy all the amenities of Sea Ranch or just relax and pamper yourself. 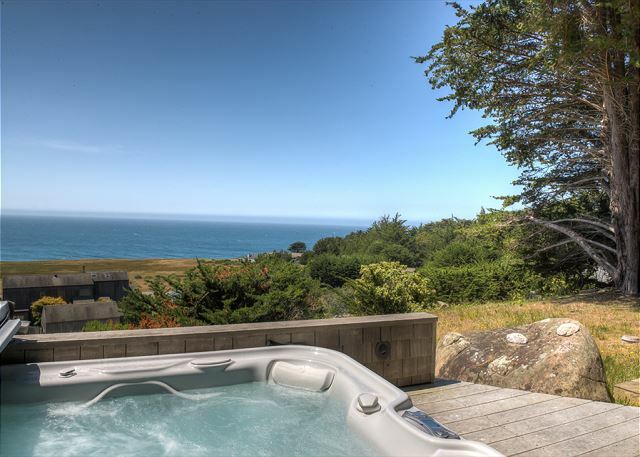 Escape to the serenity of the Sea Ranch. 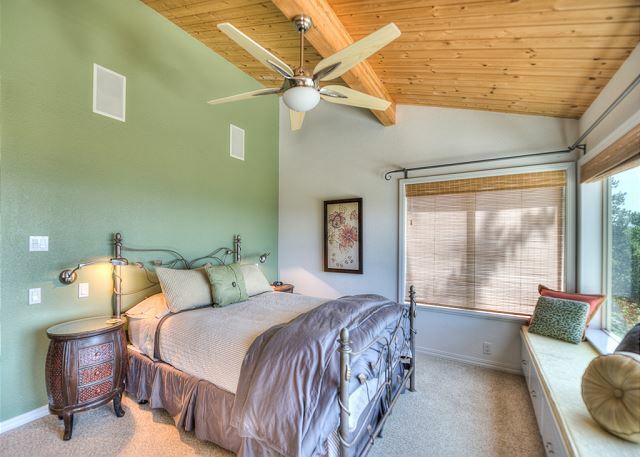 For your convenience, bed linens are provided and towels included with the Saltwater Serenity house. Surveillance camera in driveway for insurance purposes. a guest from Davis, CA does not recommend this vacation rental. The view and amenities in the house were all great. The only disappointment was that the house smelled like dog even though it was listed as a no pet home. I found clumps of dog hair in my bedroom. This was a problem for me since I have severe pet allergy. Is there any way I can get a partial refund? I was wondering if this would be too far from the bluff, but the location was great and only a short walk through a hedgerow. Being on a slight rise, it gives wide views from every room. The house has lots of bells and whistles, more than necessary, but fun, like a totally gourmet kitchen, fancy hot tub and steam shower. The only negative was there was no guide for the TV/DVD set up and no remote for the DVD, but there was a warning they would charge $500 if you messed it up which wasn’t helpful. The decor was Pottery Barn comfy, the beds were good. The bathroom for the middle bedroom was across the hall and that room got noise from upstairs, but otherwise all the rooms were very nice. There was no road noise even though it’s very close to Hwy 1. We love staying here. Beautiful house and views! This Thanksgiving was our 3rd at this house. Beautiful view. Beautiful home. Well-equipped. Everything in working order. Our annual, long weekend at Salt Water Serenity never fails to impress. The home has always been well stocked and well maintained, and provides the perfect setting for a time when all can re-connect as family. Absolutely perfect! Saltwater Serenity is a very beautiful and comfortable house. We loved the house's layout, the big kitchen island with warming oven, the huge master bath shower and bathroom, the views from all the rooms, ample deck space, and wonderful hot tub. This is a beautiful property, exactly as it looks in the pictures. 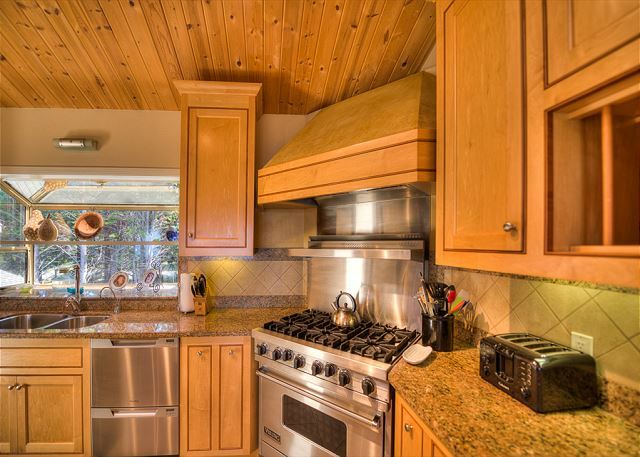 The kitchen is beautiful and the views of the ocean are gorgeous no matter where you are in the house. The property was clean and access to the beach was fairly convenient. I highly recommend this property as a place to get away to, and will certainly be returning in the future. Great house, very comfortable, spacious, ample parking, nice multi-room sound system, well equipped kitchen, easy walk to bluff trail. Three couples all had a relaxing and wonderful stay! We really enjoyed the lay out of the house with fabulous ocean views! We enjoyed the two,seating areas and decks, upstairs and downstairs. Access to coastal paths was easy as well as the Del Mar pool and Gualala for groceries. We would definitely rent this 3 BR and 3 bath house again! Only downside, the Direct TV service was out and there was no TV for two days. 8 of my family and friends just spent 6 days at Saltwater Serenity. Apparently we all needed the break as we never left this wonderful place except to see the chapel and to make 1 food run. This home was spacious enough for everyone to find their niche and relax. Will be hard to settle for anything else for our get-togethers. We are long time visitors of Sea Ranch and have been at quite a few different homes over the years...this one blew them out of the water. It had absolutely everything we needed and more. We stayed in the master suite and it had the most comfortable bed I think I have ever slept in. The steam shower now seems like something I need at my own home. Not one room without an incredible ocean view! We had so much fun hanging out with our friends. Just wish we booked it longer. One thing we did notice was that everything seemed to be made for tall people (which I am not at 5'3") so I was on my tip toes brushing my teeth in the master. :) also there is some construction going on next door that we were not aware of when we booked but it wasn't too loud. We would love to go back though and stay longer! Thank you!! We rented this home for our entire family, which is 4 adult children, 2 grandchildren (5 & 7) plus my husband and myself. The weather was spectacular. The house is set up so that you don't have to be on top of each other. A wonderful place with great views. Saltwater Serenity -- A stormy weekend! 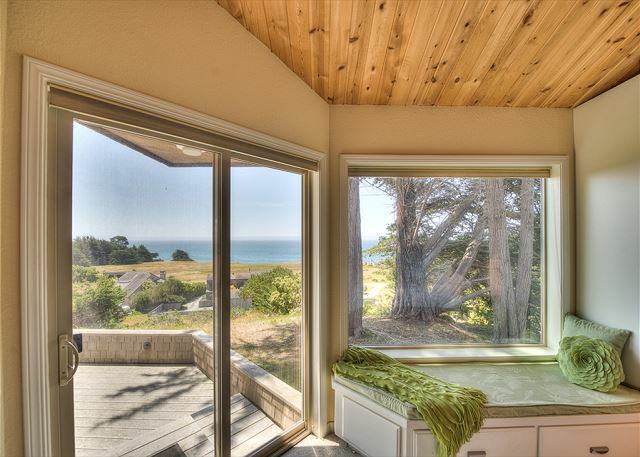 We rented this home for some clients visiting from the Bay Area -- it was their first experience in The Sea Ranch and they thoroughly enjoyed the home, the area and the views of the waves coming into Walk on Beach. Despite the dramatic stormy weather they took full advantage of the proximity to the bluff trail for a morning run in the rain. They said they couldn't have enjoyed their stay anymore than they did -- and were amazed by the ocean views from all of the rooms in the home! The house was deemed "best book club getaway to date". This home is so beautiful and clean. We absolutely loved staying there. The bedrooms were amazing and the bathroom on the master was totally awesome ! We loved the view and sat out on the decks for many hours. 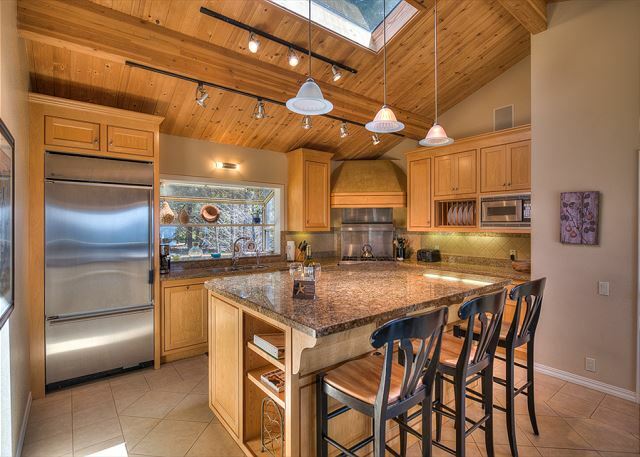 The kitchen is to die for - the island is bigger than I've seen. We loved our visit to this beautiful home. We love this home. It is a wonderful escape to the reality of how life can be when we all slow down for a bit. The kitchen is outstanding and the amenities are 5 star. There is a therapeutic sense to this home which invites meditation, mindfulness, relaxation and all of the tools (hot tub, steam shower, over size tub in master) are included to allow this process to happen. This is our second time and we will be returning. I've been bringing my children to the Sea Ranch for over 20 years. We now have only one time yearly when everyone can coordinate schedules to spend it together. The Sea Ranch is always there choice. They all went their separate ways after our stay at Saltwater Serenity and left with a true sense of renewal. We had a wonderful 3 nights at this amazing home. There were 4 couples so house was filled to capacity. The kitchen is the best one I have seen in a rental home. We love to cook so very fun environment to do so. The house has 3 1/4 baths which was great with so many of us. The only slightly uncomfortable part was the hideaway bed, but they are always hard to sleep on. The whale watching was incredible from the decks! Loved the property, loved the experience! Rented Saltwater Serenity to celebrate my wife's birthday with friends. Couldn't have asked for a better experience. 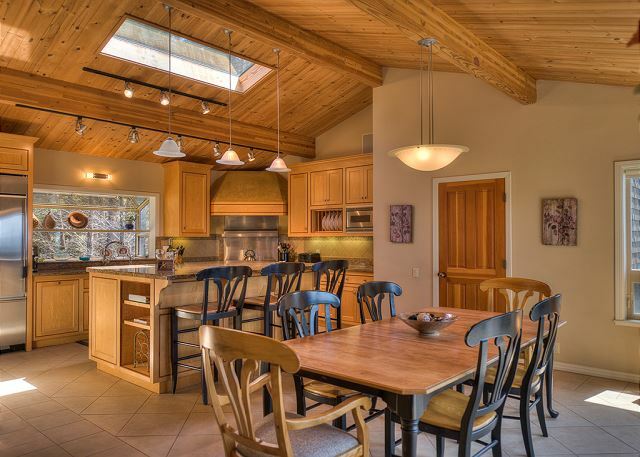 The house was fully equipped for hosting a group, great kitchen for entertaining. Loved the sound system that was able to broadcast to every area of the house. Really nice touches from the owners such as a bottle of wine to welcome us. Hot tub was amazing as it overlooked the ocean, made for an incredibly relaxing stay. We can't wait to go back, highly recommend to anyone looking to get away from it all for a few days. This is our fourth time at Saltwater Serenity, and the experience never fails to please. The accommodations are superb, with plenty of room for all. Our family looks forward to this "mini reunion" each year, and this home is perfect for our needs. 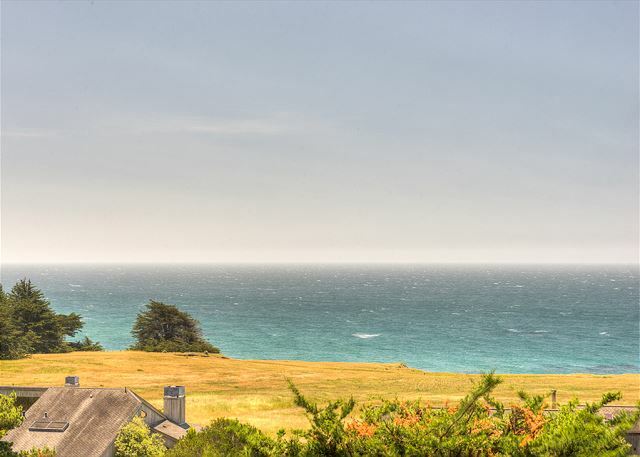 The views from the decks are gorgeous, and if you do nothing else while at Sea Ranch but look out at the water, you have found the ideal place. rotisserie that we prepared our celebratory (whole) beef tenderloin on! Amazing four days of total fun and relaxation. We are already planning our next visit! Salt Water Serenity - Perfect ! Great family time in a beautifully inviting home. We felt very pampered with all the amenities. Loved the views, trails and beaches. Looking forward to planning our next get away here ! Great experience. Wonderful location and home. 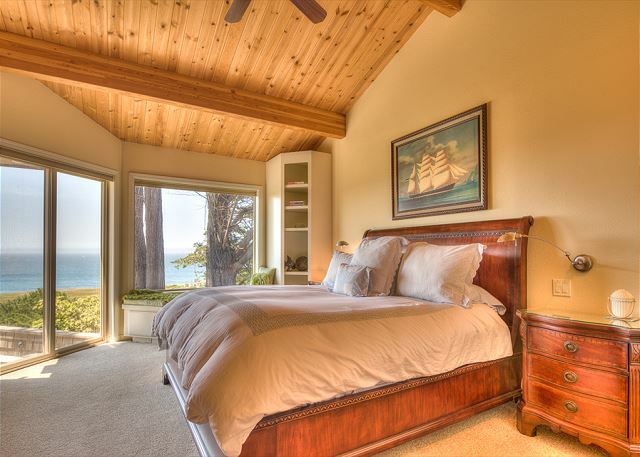 A wonderful, relaxing stay in a beautiful have home with a spectacular view. We have traveled to the No. Coast of CA for many years and we usually spent our nights camping. As we are all getting older, the decision was made to stay at a home in Sea Ranch. This was not our first stay at Sea Ranch. The home we rented was spacious and had all the comforts of home plus a wonderful view of the Pacific ocean from the decks outside the home. The trip could not have been better. We had wonderful warm sunny weather right up until the time we had to leave. Future trips to Sea Ranch are in our plans. 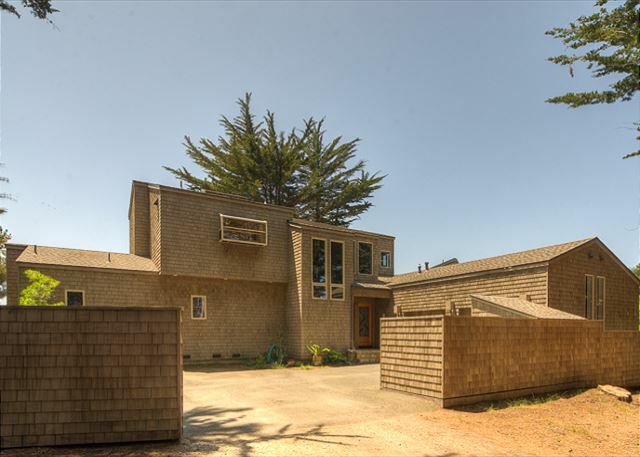 Through a wierd series of events we stumbled upon one of the best, if not the best, homes in Sea Ranch. I almost don't want others to know about it. It's clean, all rooms have an equally stunning view, a great kitchen and perfect house for entertaining or just hanging with some great friends and enjoying the true serenity this home offers. Although it's near hiway was never an issue or problem. Really stunning accommodations including location and view. Instructions for operation of household systems abound except that you either had to hunt them down (should be in the binder of information) or missing like how to operate the master bath shower water temperature controls. Very high end kitchen so if you like to cook you are in the right place. As a short person, I'll tell you the counter tops are built for giants though. Wear your elevator shoes for comfortable cooking. What sets this house apart from other homes was the ability to have two families here and maintain privacy & a quiet setting for both. This is done by having a door in the downstairs hallway between the two bedrooms on one side and the master on the other. A negative side of the house was carrying groceries up the stairs. There was very little road noise when we were there in September and we could actually hear the ocean which is pretty surprising. The beds were comfortable and the house is within walking distance of recreation. We would definitely stay here again. Sea Ranch is our annual immediate family reunion-vacation together. We have been loyal to beach rentals since they and we found each other at the beginning of Beach and our annual vacation. Through the years as the family has grown larger houses have been needed. Saltwater Serenity with it's three bedroom three bath, separate great room and living room, tremendous view, hot tub, multiple decks facing the ocean, near kids perfect great sandy beaches,tide-pools, ....perfect for us. It is not whitewater view close, but the expansive view of the Pacific and wooded seclusion is perfect for us. We are looking forward to year 30 and 30 more at Sea Ranch; the most beautiful, romantic, best family of all ages together place on earth. We had a lovely time at Saltwater Serenity with 4 people using all 3 bedrooms. The home is very spacious with kitchen and living room upstairs, TV room and 3 bedrooms downstairs, plus an ample deck and nice hottub. The stove, heat lamp and warming drawer made cooking more fun. 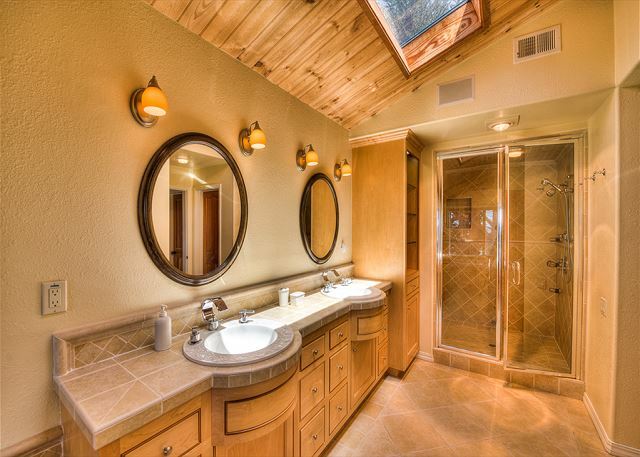 The master bedroom's bathroom is like a mini spa with huge jacuzzi bathtub and a separate steam room sauna/shower. The other bathrooms were also nice. 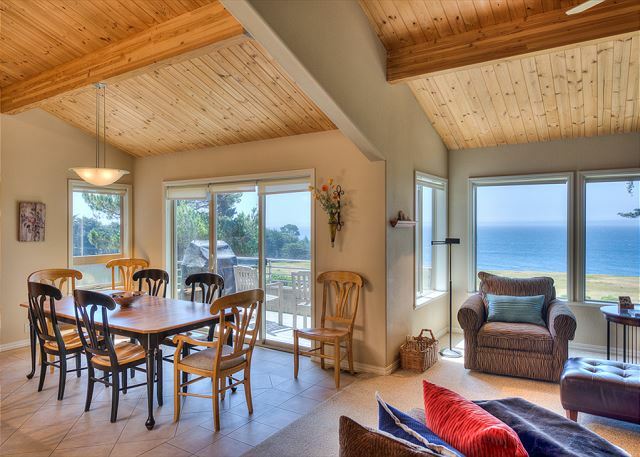 We enjoyed the ocean views from the kitchen and living room and liked having the TV separated from the main living area. 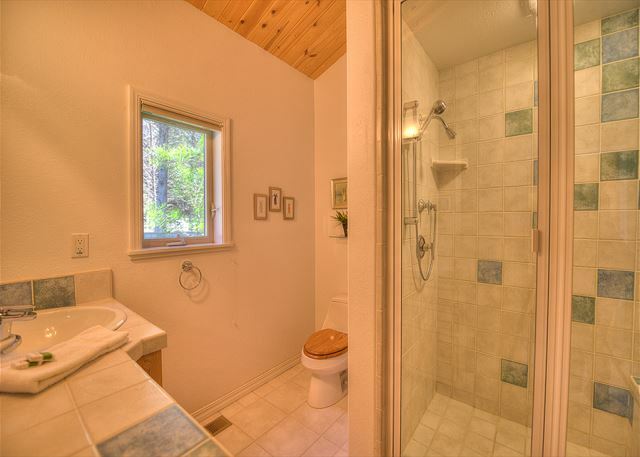 All 3 bedrooms have their own bathroom (2 ensuite and 1 right across the hall), and there is a 4th restroom upstairs off the kitchen. Although the house is on a road near Highway 1 there was no road noise inside the house--it was peaceful and an excellent location for bluff/beach walks and trips to the pool. The couches in the TV room could use an update but that was a tiny nit in an otherwise very comfortable stay. Also - a great house for people who are tall -- counters and showers were at a nice height. I stayed at Saltwater Serenity for a girls weekend. The house was absolutely everything you could have wanted and then some. The location was so beautiful and peaceful. I'd highly recommend it. An absolutely stunning view, with several outdoor sheltered and sunny areas to sit and absorb it! The home is beautiful; perfect for a family of six adults. Exceptional view of blue and some white water. Everything we needed was provided. Thank you. All that we dreamed it would be! This our fourth year in a row in this house for our one week summer stay each year and 30th at Sea Ranch. The home is excellent and meets our needs with a bathroom for each of the three bedrooms. A great location with proximity to the best beach spots and town. It's getting a bit pricey and the cleaning fee is very expensive, especially with some cleaning issues, but we are very satisfied with the house and what it has to offer and will be back next year. 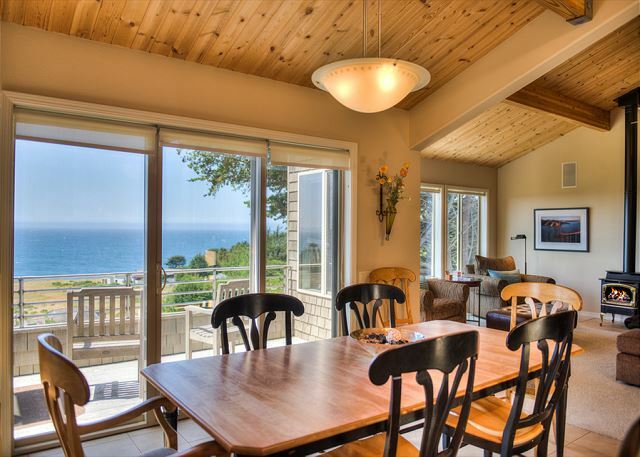 The property is sitting on a higher elevation with a beautiful view of the ocean. Very beautiful house with all the amenities one could desire for a vacation home. 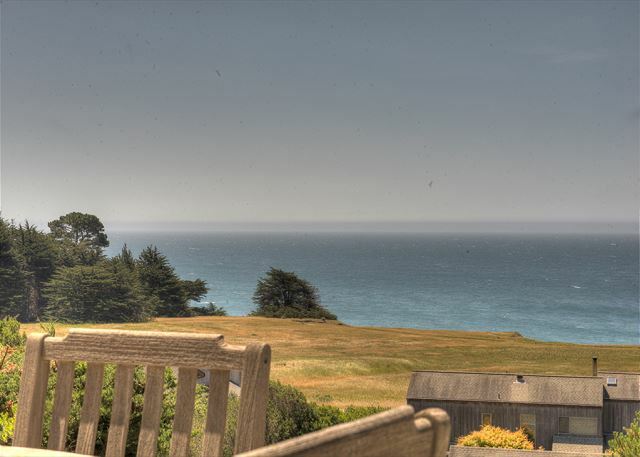 Everything was absolutely wonderful, the professional kitchen, extra clean towels and linen, the grill on the deck, etc.....Our family enjoyed a wonderful time at this house and we would definitely return for the next visit to Sea Ranch. We have stayed here a couple times now and really have nothing to complain about. From the wonderful Viking appointed kitchen to the lavish master bathroom, if you need to get away fore some relaxing quite time; this is the place. WOould recommend the house to anyone. 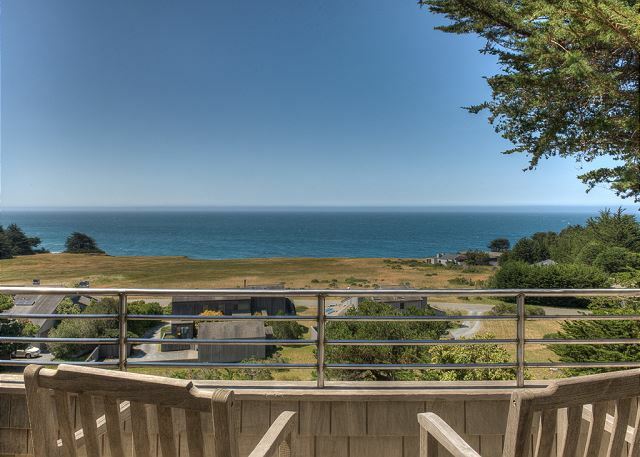 Of all the houses that I have rented in Sea Ranch, this is the best. 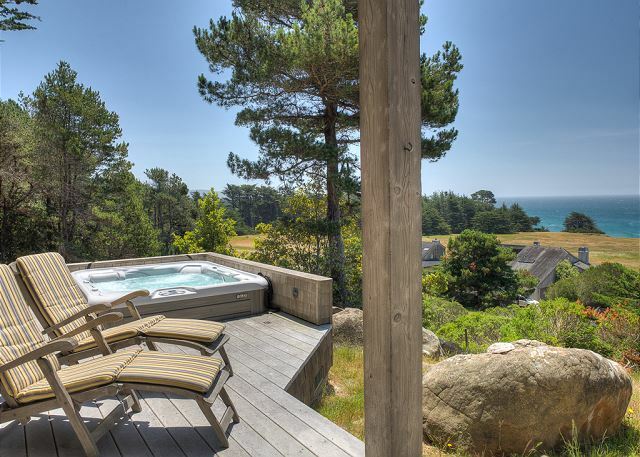 Each room has a great view of the ocean as does the hot tub. We will be renting this house again. The only thing that would have made our stay more comfortable would be to have seat pads for the outside furniture. The staff at Beach Rentals is pleasant and easy to work with. Been rented houses on The Sea Ranch more than dozen times,but this one (Saltwater Serenity)is the best yet and the management was nice and professional.Awesome,Awesome,Awesome!!! Thank you! Enjoyed a family vacation with all our adult kids and loved our stay in this beautiful home. Wonderfully appointed and comfortable property. 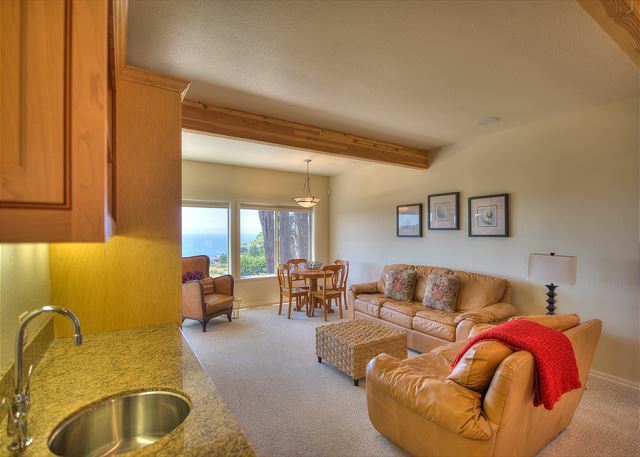 Quiet with beautiful views of the ocean and bluff and centrally located to all the beaches we love. We appreciated the additional TV in the master bedroom and love that the main living space is TV free. Perfect for readers. This is our 31st year at Sea Ranch and our second stay in this house. Everyone wants to return to this house next year. (Suggestion - Would love discounts for longer stays - two+ weeks). Great House. Interiors and views are excellent. Deck Furniture could be better cared for. 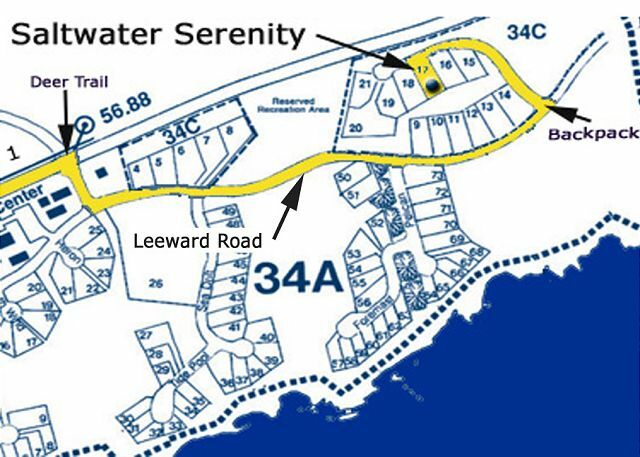 Saltwater Serenity is a beautiful property with just about everything you could want in a vacation home. It is by far the nicest rental home we've stayed in. It has a great layout and nice views from every room. There are lots of little touches that make it feel like home. We'll definitely be going back. 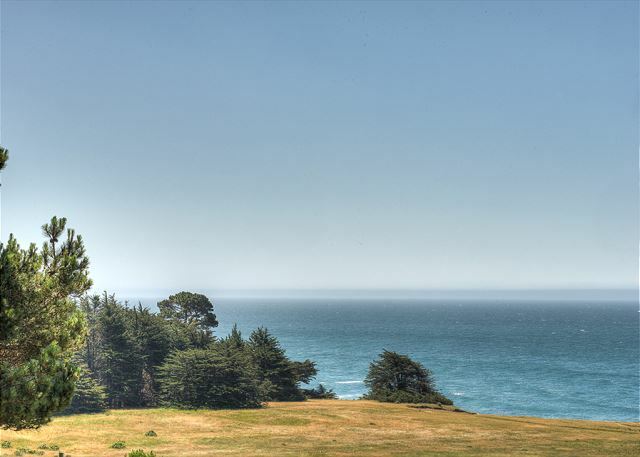 Sea Ranch is the most beautiful, romantic and relaxing place in the U.S. I have found! A great place to relax in luxury. 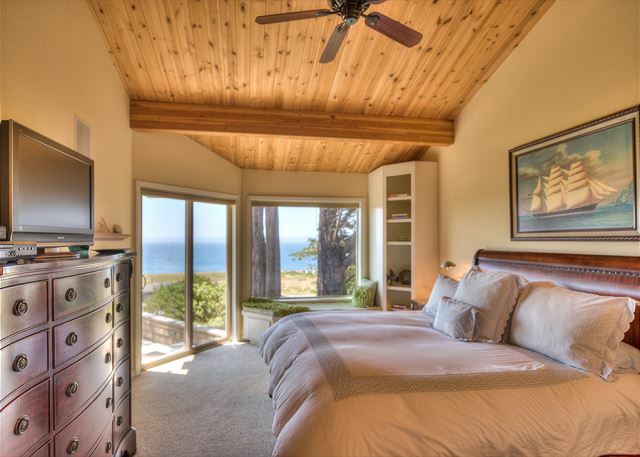 Well designed, high quality construction, and perfect ocean views from all rooms. The sound system is really nice, but can be confusing and could not get my iPhone connection to work. But that is very minor, and overall I could not recommend this property higher..
We had a fantastic time. My only reservation was the sound system. While it was neat to be able to operate it remotely from different places in the house, the amp didn't have a receptacle that could accomodate the jack from my MP3. However, this would by no means be a deal point in a revisit to Saltwater Serenity. Excellent vacation rental. Stayed with a group of friends and all enjoyed it immensely. This home is new, modern, well appoint & vey comfortable. A view from every room-spectacular. Only downside, & maybe I'm not idealistic enough; only one small TV downstairs in den, nothing uspatairs where you live the most. Still recommended..